Easy Cut Out Sugar Cookies bring me waaayyyy back. My mother, Norma Jean, made these during my childhood, and the memories are flooding in. They are super easy to make, and perfect for decorating. 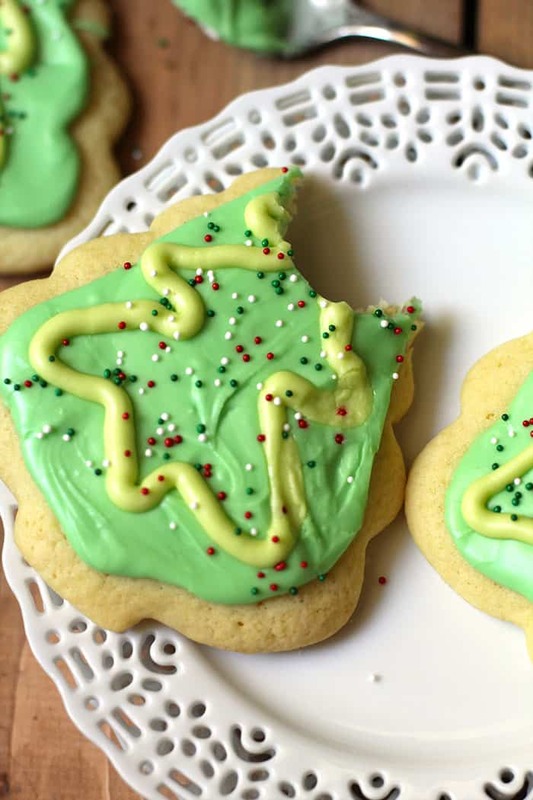 Get your friends and family in the kitchen, and have a cookie-making party! I’m the fifth kid out of six in my family. When Mom made cut out sugar cookies, I can recall getting to help decorate them. I’m pretty sure mine weren’t all that pretty, but instead, PACKED with sprinkles. Meanwhile, my older siblings (especially my artsy sis, Jackie) had that decorating knack and made the pretty cookies that went in the the GOOD cookie container. Mine went in the CUTESY little kid container (aka the sloppy ones that everyone ate to be nice). Truth be told, I’ve never been one for decorating cookies. Back before my blogging days (just over a year ago), I’d have just put some colored frosting and some sprinkles on top. That extra bit with the tree outline? Nope. I wouldn’t have bothered. But now? Heck yes. I’m going to TRY to make them look pretty and festive and all Christmas-yyyy. 🙂 Because I blog and pretty pictures are EVERYTHING. Make a large batch of icing. Divide into two bowls – one with 2/3 of the icing, the other with 1/3. Color the larger bowl a regular green and the smaller a fluorescent type of green (or you could use any color you choose). 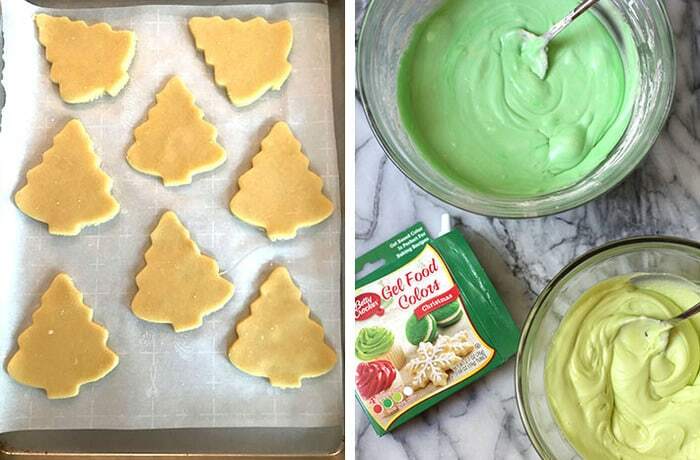 Put the fluorescent green icing in a decorating bag/kit. 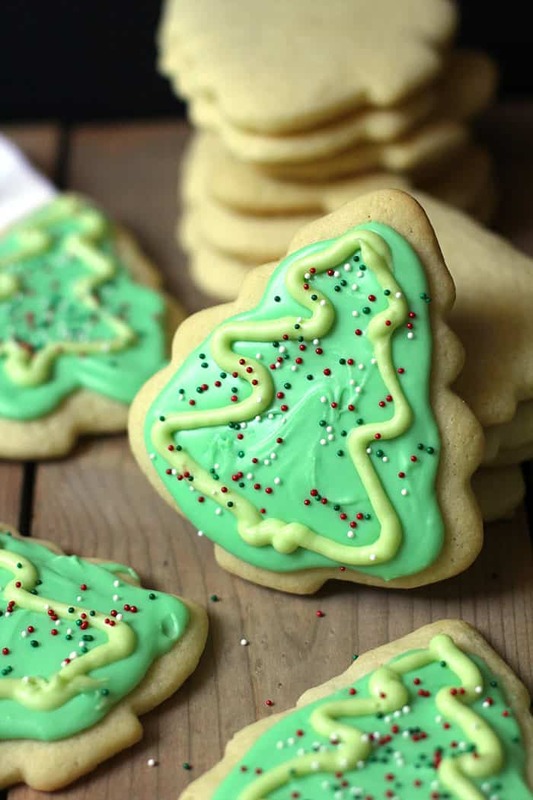 Frost with the regular green first, followed by the outline of the tree, using a decorating tool, and then top with sprinkles. Let the cookies rest on cooling racks so the frosting sets up. You can use any cookie cutter you want. I’ve done Santa Claus, candy canes, gingerbread men, and ornaments. All are great. I decided to stick to ONE kind for this recipe, but I’ll use something else the next time I make them. 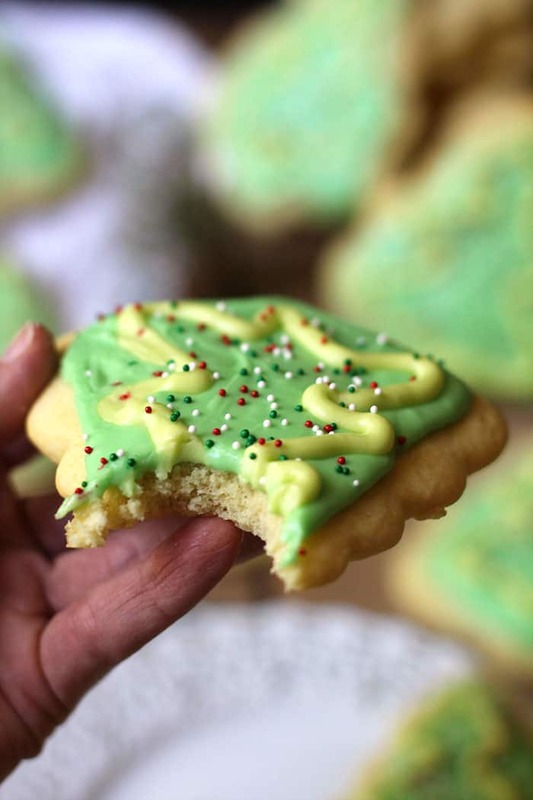 A few other tips for making EPIC sugar cookies. Make the dough the day before you bake the cookies. Store in the refrigerator overnight. Use plenty of flour on the surface before rolling the dough out. This will ensure it doesn’t stick. Be careful to not OVER-roll. You want the cookies to be about 1/4 inch before baking. If you roll too much, the cookies will be too flat and not as tasty. After cutting the shapes out, take all the scraps (left around the shapes) and roll out again to make additional cookies. Bake for approximately 11 minutes, or until cookies are just about to start browning. To store these fancy cookies. Place as many cookies as you can on a baking sheet, careful to not overlap. Place in freezer for 30 minutes to quick-freeze. Stack them in an airtight container and place back in the freezer. Repeat until all cookies are packaged and in the freezer. If you use this method, your pretty icing will still look pretty after stacking. Quick-freezing is the way to go and well worth the additional effort. Oh the memories. After sampling the cookie below (yup, I ate it! 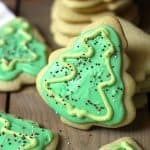 ), I decided that one, the taste was just as good as I remembered, and two, I want to make some dough and freeze it so my boys can have a go at decorating cookies over the Holidays. Not sure how much they’d enjoy it, but I would love doing that together. 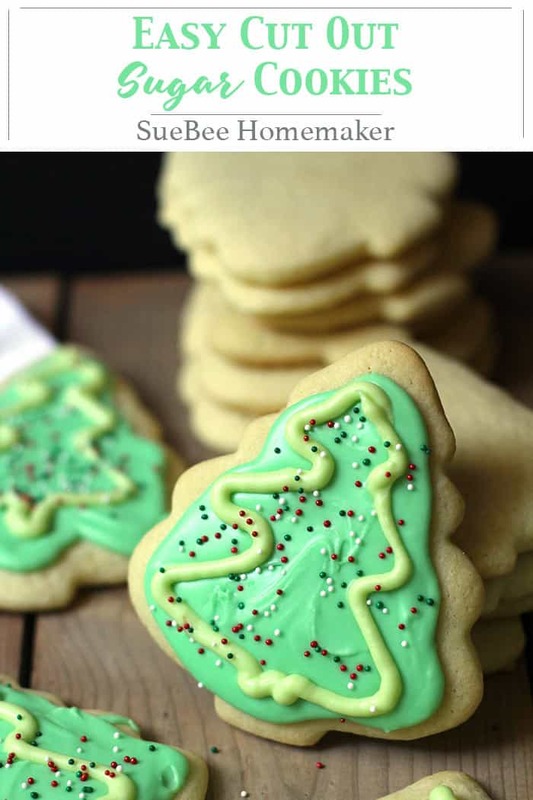 Get your kiddos in the kitchen this holiday season, and bake up some Easy Cut Out Sugar Cookies. Making memories at Christmas time is so much fun. Easy Cut Out Sugar Cookies bring me waaayyyy back. My mother, Norma Jean, made these during my childhood, and the memories are flooding in. In a standing mixer, cream butter and sugar together. Add eggs and vanilla and mix well. In a separate bowl, combine the dry ingredients - the flour, cream of tartar, baking soda, and salt. Pour into mixer and combine with wet ingredients, mixing until just combined. Don't over-mix. Scoop dough into an airtight container and store in the refrigerator overnight, or for at least several hours. Form the dough into a ball and place on floured surface. Using a rolling pin, roll dough out into thin layer, about 1/4 of an inch. Take cookie cutter, and cut shapes out of dough. Lift gently onto prepared baking sheets. Bake for approximately 10 minutes. Remove to cooling racks. When the consistency is correct, separate into two bowls (the tree outline will take far less frosting so add less to one bowl). Add food coloring to each bowl, placing the one for the tree outline in the decorating kit. Spread some of the darker green icing on the cookies. Draw a tree with the fluorescent green. and them add sprinkles. Use plenty of flour on the surface before rolling the dough out. This will ensure it doesn't stick. To freeze cookies, place in single layer on baking sheet. Then place in freezer for 30 minutes to quick freeze. Repeat until all cookies are frozen. Stack cookies in airtight container and store in freezer for up to two months. Made sugar cookies this year, for the first time since my kids were home and young enough to want to frost them. Sue’s post motivated me, partially because of nostalgia, but also because my family still loves them. I followed Sue’s direction to make them puffier by not rolling too flat, but then I decided to also make some flatter and crispier – remembering that I also like crunchy sugar cookies (like my Dad). Puffy or crispy, they were as tasty as I remembered. I sent some home with family after our Christmas party, and froze the rest, There can never be too many Christmas cookies, except that now everyone is starting their post holiday diets.